Offer info sessions in the Theater seating approximately 90 guests. 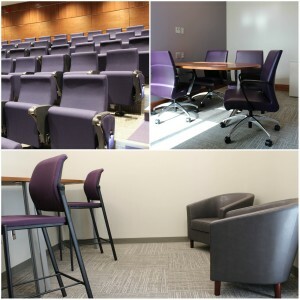 Schedule on-campus interviews with larger interview rooms, a number of them equipped with video conferencing capabilities. Relax in the exclusive employer lounge furnished with wifi and free printing. The career readiness of students and strong recruiting interest from industry is part of the reason why 94 percent of last year’s graduating class was employed or enrolled in graduate education within six months of graduation. The K-State Career Center provides the opportunity to grow young people into professionals by connecting them and their skills to the needs of employers recruiting at K-State.